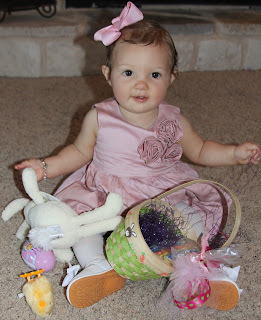 We had an incredibly busy Easter weekend! McKenna was in a high school baseball tournament here in town so we started Saturday morning at the ball park! Reese loves watching any kind of action, so having a brother that plays it all is perfect! She is a very enthusiastic fan!!! Can't wait until she starts talking, we may have to get a muzzle!! Before the game was over, I had to go over to the children's park and start decorating for our churches annual Easter in the Park. We sponser the event for our community and have well over 500 people come out with their kids to hear the "real" Easter story, hunt a few eggs and eat lots of goodies!! The Easter bunny usally make an appearence!! She went after those eggs with a vengence!! Haha....She really would have been happy with just ONE egg, as long as she could get what was inside!! 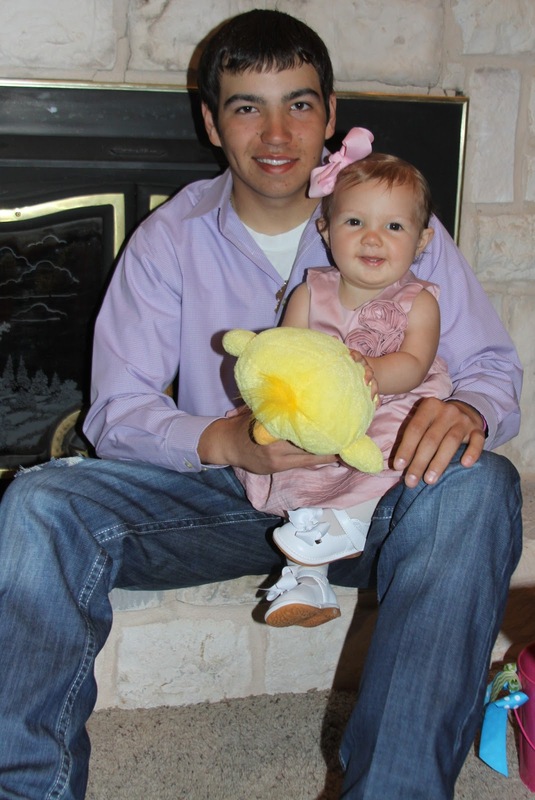 She was perfectly fine with the Easter bunny as long as Daddy was right there!! Oh well, maybe next year!! I just LOVE this picture! She looks so big to me! I can't believe she will be ONE in just a few months!! Sunday morning we got up for church, Easter in our house has never been about bunnies or candy, even growing up, my Mom didn't let us get to wrapped up in all the "hoopla." We do give our kids a little bit of goodies but I want my kids to remember Easter as always going to church, fellowshipping with our friends and having a wonderful dinner with family as we celebrate that our Savior is ALIVE!!! McKenna is a wonderful brother!!! He was 3 when Clint and I married and has been like my own child. He is very protective of Reese and loves her very much. She loves him too!! My precious girl desroying the basket that Granni and Pepaw brought her!! She loved the grass! !